New Zealand, or Aotearoa, is a mythical land steeped in legend and mystery. Treetops Lodge offers the ultimate in world class luxury accommodation and is located in the heart of the trout fishing capital of the world and famed therapeutic thermal region, Rotorua, New Zealand. The diverse landscape of Rotorua is where adventure abounds. Nestled amidst magnificent native forests and valleys, Treetops Lodge and Estate offers a uniquely New Zealand experience. The Lodge with its’ elegant architectural style derived from this country's pioneering past. Timber and stone finishes echo the beauty and simplicity of the great outdoors at Treetops Lodge. A sanctuary and retreat of breathtaking terrain in 2,500 acres of secluded native forest and game reserve, seven trout streams, four lakes, over 70 kilometers of hiking trails, mountain bike riding, horse riding and the ultimate in tranquillity and splendour The New Zealand forest is unique in the world - a rich, temperate rainforest that in its original state is one of the last remnants of the ancient continent of Gondwanaland. Upon arrival at Treetops Lodge & Estate, pass through the gates and be transported to another world, time and place. 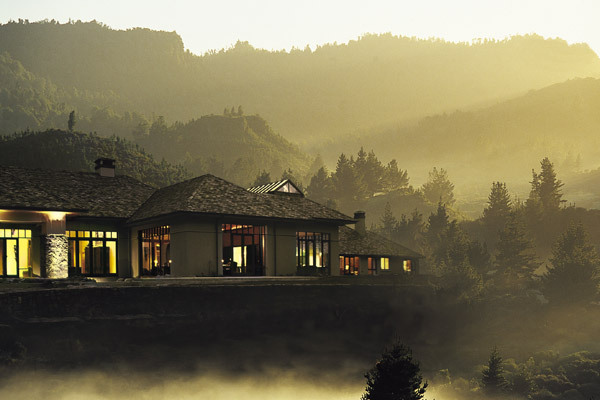 Wind your way up through a New Zealand virgin forest canopy of native flora and arrive at the luxurious lodge. A warm greeting and welcoming hand from the Treetops team, draws you into the magnificence of the place. Sparkling cascades of water tumble over rocks on either side of you; nature embraces you with the ornately carved wooden Rimu doors depicting the beauty and abundance of the valley. They open, beckoning you into the splendour of the Great Room. The harmony between man and nature is realized. Everything that is New Zealand from carvings, local artistry of the outdoors to hand carved beams depicting Maori folklore is in this uniquely New Zealand Lodge. Enter the Great Room, rich in textures and luxurious furnishings that echo the beauty and simplicity of the great outdoors. The Lodge Wing accommodates eight guests, twin share or double in four suites with ensuites; all sharing the privacy of the Lodge Wing lounge and 'state of the art' kitchen. Wrapped in luxury, your room awaits you… A nest of warmth and comfort, with no expense spared to satisfy your senses. A visual splendor spreads before you with luxurious fabrics and furnishings. Each room has its own unique character, individual style and design with a beckoning, bubbling spa bath. Handcrafted New Zealand chocolate at your bedside ensures you of sweet dreams… You are assured of the best night's sleep. Wake revitalized to the chorus of native birdcalls and the forest buzzing with life. Ease into the day on a sun lounger, soaking up the New Zealand sun. Alternatively, choose from one of eight privately situated Villas. Tucked away, the Villas are positioned within a stroll or golf buggy ride to the Lodge. Choose a secluded haven framed by native virgin forest or look out over lakes and wildlife on the Treetops Estate. Warmth envelops you in Library which is a timber-panelled sanctuary crafted from the wood on the estate with a richness of a past steeped in culture. Great Maori Chieftains watch majestically from the historic artwork, which adorns the walls. Daydream on the window seat overlooking the swirling stream or curl up with a novel beside the blazing fire. In the Games Room the distinguished tastes of yesteryear are captured with the antique billiard table and memorabilia from the pioneering days. Stylish designer lighting throughout the lodge allows for ease on the eye and a dim serenity while you sip a cocktail as the sun slowly fades like a dream and slips into night. The Conference Room is formally furnished with dignity and every facility available to suit your business needs, with valley vistas stretching out below, this is the ideal executive retreat. The still serenity of Treetops will ensure a greater focus removed from the ordinary world. The Dayroom offers cool and calm with soothing colours and luxurious fabrics sink into a sofa as time eases by. Watch the whispering water as it flows over the rocks, framed by native fern fronds. Contemplate the cycles and mystery of life as it unfolds, celebrating renewal and new beginnings. Feel rested and refreshed. The Kitchen is a welcoming, warm & elegant open plan "gathering" place where aromas of delectable dishes full the air to tempt your taste buds. Breakfast in this light, airy space soaking up the peace is available in The Conservatory. Vast windows and skylights invite Mother Nature in. Rich, warm and enticing, the crafted, candlelit table stretches out in the Dining Room where many a guest traveller has dined over clinking glasses while sharing fascinating stories with fellow guests. Trout swim in the water along side the room as the valleys yawn below. Great spaces for intimate dining, or sharing this place with new friends. Rotorua is New Zealand's own adventure playground. Close to this geothermal wonderland and spectacular Lake District of Rotorua and the Bay of Plenty, Treetops awaits your discovery. Venture out on unique South Pacific 4WD trails. Climb on board one of the latest Rangerover, Discovery, Freelander or Defender vehicles. Landrover Experience is world class and is Australasia's first purpose built facility. Enjoy splendid scenery while having picnic at one of numerous vantage points. Alternatively discover and explore varied trails in the region on an unforgettable adventure using 4WD Motorbikes. Among the most magnificent abseiling bluffs in the region are on the Treetops estate, within walking distance of the lodge. Includes all equipment, personal instruction and transfers. Using a high tech compound bow, practice archery according to your skill level on target ranges or a simulated hunting range complete with Mackenzie targets. Spot rare New Zealand bird life found on the estate. Complimentary commentary and bird calling tapes available. Be led through the forest by a knowledgeable guide, ensuring you don't miss any rare birds. Take a shot at the 25 clay bird target range. Includes tutor, clay targets, ammunition and shot gun. New Zealand boasts among the best year-round brown and rainbow trout fishing in the world, with lakes and rivers stocked with fish in size and number not found anywhere else. Lake Rotorua, and its streams and tributaries, is ranked as the best catch rate per hour in the world. For anglers wishing to enjoy the ultimate in sight fishing in the Rotorua region, Treetops offers daily guided fishing adventures with experienced, professional guides, at competitive rates. Rotorua has New Zealand's greatest array of streams, rivers and lakes - a fisherman's paradise. Treetops is the trout fisherman's Mecca. Rise with the dawn, slip out and fish at your doorstep or 'fish the twilight' at one of our streams or lakes, before sipping cocktails. No charge. Comprehensive equipment packs available: rods (fly & spin), flies, lures, landing nets, vests and waders.